Fourth CCW Group of Governmental Experts meeting, 25-29 March: Delegation List, Side Event Flyer, Statement (27 March), Statement (29 March). Global Campaigner’s Meeting, Berlin, Germany. Media Advisory in English, in German (7 March), Public Event Invitation (21 March). Ipsos Global Opinion Poll on Fully Autonomous Weapons Systems, Press Release (22 January), Web post (22 January), Media Coverage (Jan.-Feb.). Correspondence: Letter to New Zealand (4 April). CCW annual Meeting of High Contracting Parties, 21-23 November: Press Release in English & French, (Nov. 26), Statement, Media Advisory in French, Country Views (22 Nov), Delegation List, Side Event Flyer. Third CCW Group of Governmental Experts meeting, 27-31 August: Statement, Delegation List, Presentation by Amr Gaber, Side Event Flyer, Media Advisory (in Arabic and French), Opening Press Release 27 August 2018 (in Arabic, French, Russian, Spanish) and Closing Press Release 3 September 2018 (in French). CCW Group of Governmental Experts and annual meeting, November 2017: Report on Activities, Statement to annual meeting, GGE Statement, Press Release, Delegation List, Side Event Flyers (22 November & 13 November), SEHLAC report (Spanish), Country Views (“The List”), List of Ban Endorsers. 72nd UNGA First Committee on Disarmament and International Security – Side Event Flyer (16 October), Statement (10 October). CCW Fifth Review Conference, 12-16 December 2016: Report on Activities, Campaign Delegation List, Side Events Flyers (14 December & 15 December). 71st UNGA First Committee on Disarmament and International Security: Compilation of Country Statements, Campaign Statement, Side Event Flyer (18 October). PIR Center conference on emerging technologies, 29 September: Statement. Preparatory meeting for the CCW Fifth Review Conference, 31 August-2 September 2016: Statement. Third informal CCW meeting on lethal autonomous weapons systems, 11-15 April 2016: Report on Activities, Country Views, Press Release, Frequently Asked Questions, Campaign Delegation List, List of Campaign Side Events (on 13 April, 14 April, 15 April), List of Female Experts. CCW annual meeting, 12-13 November 2015: Report on Activities, Statement, Side Event Flyer. 70th UNGA First Committee on Disarmament and International Security, October 2015: Statement, Press Release, Jody Williams message, Media Advisory, Side Event Flyer. Artificial intelligence call to ban autonomous weapons, July 2015: Open Letter, Compilation of Media Coverage. Second informal CCW meeting on lethal autonomous weapons systems, 13-17 April 2015: Report on Activities, Letter to Germany, Press Release, Country Positions, List of Side Events, Frequently Asked Questions – en español, Letter to Germany & List of Suggested Expert Women. Letter to Angela Kane, UN High Representative for Disarmament, 30 March. CCW annual meeting, 13-14 November 2014: Report on Activities, Statement, Press Release, Side Event Flyer, Delegation List, CCW Backgrounder. 69th UNGA First Committee on Disarmament and International Security, 28 October: Statement, Media Advisory, Side Event Flyer, New School Flyer. Presentation to the UN Secretary General’s Advisory Board on Disarmament, 4 July. Human Rights Council, 13 June: Statement. See also Synopsis of the 2014 and 2013 reports by UN Special Rapporteur Christof Heyns. First informal CCW meeting on lethal autonomous weapons systems, 13-16 May 2014: Report on Activities, Statements (13 May & 16 May), Press Release, Frequently Asked Questions, List of CCW Side Events, Delegation List. CCW annual meeting, 14-15 November 2013: Report on Activities, Statement, Press Release, Side Event Flyer, Backgrounder. 68th UNGA First Committee on Disarmament and International Security, 29 October: Statement, Press Release. Human Rights Council, 28-30 May:Report on Activities, Statement, Press Release, and Synposis of UN report. Statement to the UN Secretary General’s Advisory Board on Disarmament, 28 June. European Parliament report: Synopsis, 12 June. 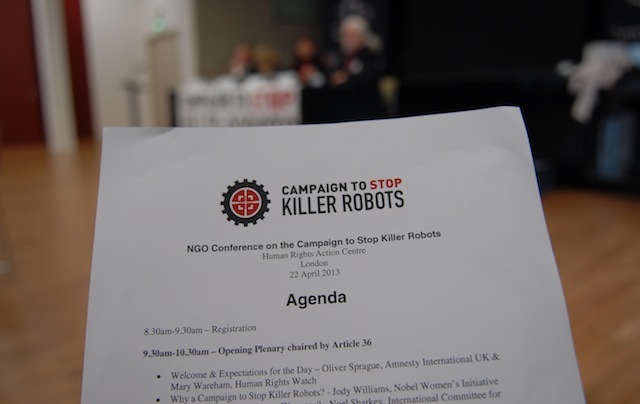 Campaign to Stop Killer Robots launch, 22-23 April: Report on the Launch, Press Release.